When Stephanie got in contact with me and asked if I would like to review her poetry, I jumped at the chance. I have really slacked in poetry reading over the last couple of years and wanted to get back into it with a bang. That I certainly did. I love her dedication and acknowledgements - she is a girl who has been through the wars and come out fighting and that is something I admire in any person. I knew that this personality would shine through in her poetry and I certainly wasn't wrong. 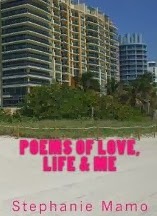 As you can probably guess by the title, her poems are all about life, love and her - there are some real emotional poems in there and then she breaks them up with something light hearted like The Man or TECHNO! My particular favourite poem of the collection has to be Stars - the poem is absolutely beautiful. I love these few lines especially 'Until the world no longer turns, this flame for you will always burn. The stars are there to remind me of all the good times that we had. When you're not here the stars are empty - and my heart is sad' - could she have described love any better? I don't think so. This poetry collection has something for everyone - fun poems such as TECHNO!, slightly risque for younger readers like The Man, poems of pure emotion such as This Heart Will Love Again. I truly recommend everyone picks up a copy from Amazon here - £5 for an eBook copy or £5.37 for a paperback. Enjoy!